John M. Davis, III, D.D.S., P.A. Tensage is a skincare line using a growth factor that does not come from human source. Skin care growth factors have been harvested from humans but Tensage has found a way to harvest a specific growth factor from a nonhuman source. Tensage obtains its growth factor from a specific species of snails. The snails are not harmed in the collection of the growth factor nor are they left defenseless. The story behind this line starts with a specific species of snails that has been studied extensively after being discovered. This specific snail was first discovered in Spain and when it was found it was discovered that any time it was injured or burned it could heal itself within 24 hours. So when scientist saw this they started to look at what it was secreting and it was secreting a growth factor. The scientists specifically looked at and observed this growth factor. After years of research European scientists discovered and patented a unique way to harness the technology to help damaged skin: SCA Biorepair Technology. It was later used to heal a person with radiation damage in 1986 who had been involved in the 1986 Chernobyl nuclear plant accident in Ukraine. The person's radiation burns started to heal dramatically within 2 weeks with the use of this growth factor. Its dermatologic healing use with damaged skin proved to be remarkable and the aesthetic industry took note of this growth factor. 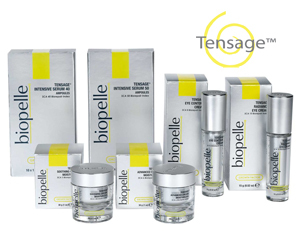 Using the technology of SCA Biorepair technology, the growth factor, SCA (Secretion of Cryptomphalus Aspersa, the purified secretion from this special species of snails) is now available exclusively in Biopelle Tensage skincare line to help supplement the decrease level of growth factors that occur with the aging process. It also helps skin that has been damaged by photoaging (this is damage that skin can suffer from exposure to sunlight over the years, to UV radiation: the appearance of wrinkles, leathery skin, sagging skin, dark spots or age spots, broken blood vessels, fine veins showing up on the face, yellowish tint - sun exposure is one of the extrinsic factors that can age the skin) and helps recovery of skin following dermal procedures. The use of this skincare line improves skin with strengthening of collagen resulting in firmer looking skin and skin with renewed elasticity. Fine and coarse wrinkles are smoothed and hydration is increased for softer skin. The daily use of the Tensage regimen generates visible improvement in skin tone and texture. Biopelle Tensage products use this patented SCA biorepair technology that incorporates the growth factor, Cryptomphalus Aspersa, secreted by this specific small snail to heal itself in a purified form. This purified ingredient is found as noted exclusively in Biopelle Tensage products. 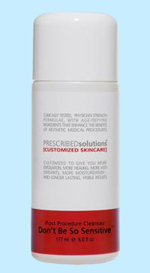 Recommended Cleanser: Prescribed Solutions Don't Be So Sensitive. The use of any skincare line that assists in youthful results is a supplement to the efforts of facial rejuvenation. Patients are encouraged to use what works best for them. This office will continue to seek and recommend skincare products that will assist in your facial rejuvenation endeavors. Copyright © 2012 - John M. Davis III, P.A. All Rights Reserved.